I’ve recently returned from Impact 9. The international Printmaking Conference, 22nd – 25th September 2015, was hosted by the China Academy of Art in Hangzhou, China. Hundreds of artists, academics and traders were given an incredibly warm welcome by the CAA’s printmaking students and staff. This was the venue for the second exhibition of graphic scores, I made in collaboration with Raymond MacDonald, and previously exhibited at the Talbot Rice Gallery in Edinburgh. Raymond performed the scores with George Burt, guitarist, from Scotland, and, Laofu (guitar), Yu Chen (saxophone) and Li Ping (drum) from Hangzhou. It was a wonderful meeting of musical talents, with the scores being interpreted, and translated, by the Chinese and Scottish musicians. The first rehearsal with all the musicians present was in the exhibition space, on the afternoon of September 24th. People listened to the musicians practice and asked questions throughout the afternoon. There was a final performance at 3pm, followed by more discussion. 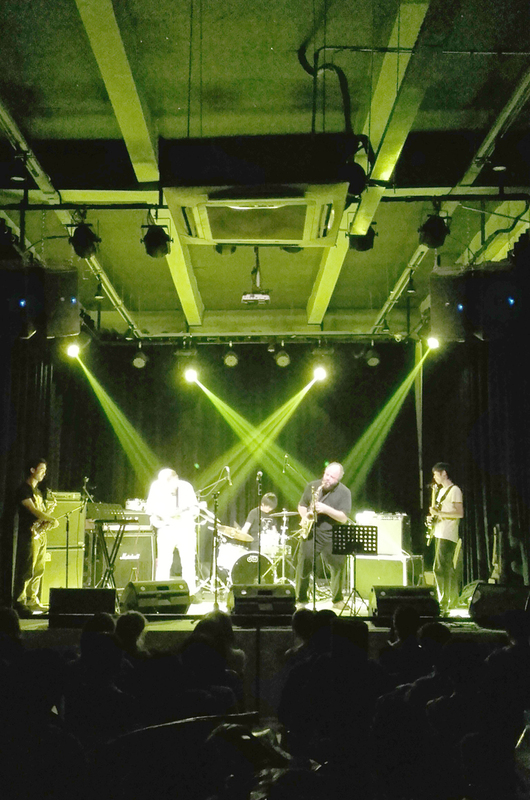 In the evening, the musicians performed at, Line Out, a regular music venue in Hangzhou. The first set included a Manuscript, one of the graphic scores that had been played in the afternoon and that had helped the musicians to play and improvise together.